Does early-life pain create a susceptibility to chronic pain in later life? As recently as the mid-1980s it was widely believed that preemies and newborns could not perceive pain, and medical procedures — including major surgeries — were routinely performed on days-old babies without anaesthesia. Now, not only is it understood that babies can feel pain, but evidence is mounting that pain, infection, trauma or stress experienced very early in life can sometimes have profound consequences later on, including increased sensitivity to pain, chronic pain, inflammatory disease or even depression. 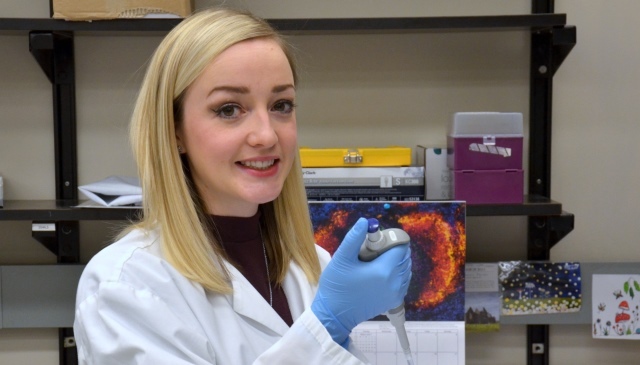 Postdoctoral scholar Nikita Burke, PhD, of the University of Calgary’s Faculty of Veterinary Medicine and Hotchkiss Brain Institute (HBI) is studying the link from early-life pain to altered sensitivity to pain in adolescence, and she has recently been awarded an Alberta Innovates Postdoctoral Scholarship for her work. “The Alberta Innovates scholarship supports my research and broadens my experience outside the lab,” Burke says. “Opening the door to these training and mentorship opportunities is key at this time in my professional development,” Burke says. It is as though neonatal pain changes the very blueprint of the central nervous system (CNS). So, it follows that for answers Burke is looking at the architect in charge of that blueprint, which in the case of the CNS is a type of cell called microglia. Microglia are immune cells that are also instrumental in the development, repair and protection of the nervous system. Their dual role is especially interesting, as communication between the immune and nervous systems has been shown to be critical in the development of chronic pain. Burke’s research has particular resonance in a world where 15 million babies are born prematurely each year, a number that is growing with medical advances. Those pre-term babies by necessity require more than 10 painful procedures each day. “With more and more babies exposed to pain early in life, the consequences can be quite profound,” Burke says. Burke, an Eyes High Postdoctoral Scholar, is a native of Ireland where she completed her PhD at the National University of Ireland, Galway. Her previous work, completed at the Universidad Complutense Madrid, showed that early life stress resulted in increased nerve pain-related behaviour in adulthood. She was drawn to the University of Calgary to work with HBI member Tuan Trang, PhD and his research team who study pain, opioids and glia. “Canada is a world leader in pediatric pain research; the benefit of this lab in particular is we are equipped to look at the whole system from animal behaviour right down to activity at the molecular level,” Burke says. In addition to the Alberta Innovates postdoctoral fellowship, Burke’s work is supported by the Vi Riddell Children’s Pain Research Grant. Her research aligns with two of the university’s strategic research themes: Brain and Mental Health and Infections, Inflammation and Chronic Diseases.